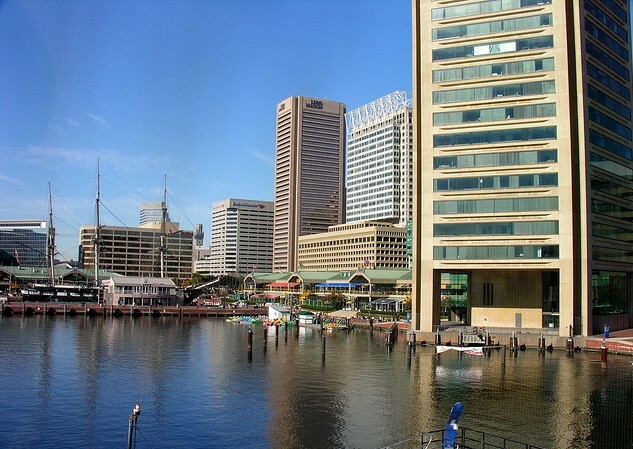 Photo above: Baltimore Inner Harbor by CaDaFelta1 with Flickr Creative Commons License. Don Fray, at podium, and a panel of economic experts. Despite “lagging behind the nation,” Maryland’s fiscal forecast appears optimistic, speakers agreed Thursday at the Greater Baltimore Committee Economic Outlook Conference. Hundreds of leaders and managers from Baltimore-area businesses gathered at the Hilton Baltimore for breakfast to hear the state and regional fiscal forecast. “Maryland is lagging behind in the nation… but I am optimistic about 2015,” said R. Andrew Bauer, regional economist for the Federal Reserve Bank of Richmond, Baltimore Office and keynote speaker for the GBC conference. “Next year is not going to be an exciting time, but a steady time… For Maryland this will be a year of growth,” said Bauer. A panel of economic development directors for Baltimore City and neighboring counties offered status reports underscoring Bauer’s analysis of Maryland’s current economic reality and concurred with his forecast for 2015. “I agree with the speaker when he said Maryland is lagging behind,” said James Richardson, director of the Harford County Office of Economic Development. But he noted that the apartment market is doing well, and they have seen growth in the technology sector. In data issued by the U.S. Department of Commerce’s Bureau of Economic Analysis, Maryland’s economy ranked second worst in the nation and registered zero economic growth in 2013. Maryland was later ranked 5th best in the nation in the “2014 New Economy Index,” a data analysis published by the Information Technology and Innovation Foundation measuring a state’s economic potential. “This area is the epicenter for growth,” said Edward Rothstein, president and CEO, Anne Arundel Economic Development Corporation. Speakers also forecast cyber and technology sectors adding to the job market and stimulating Maryland’s economy. The information technology sector stands to add hundred of jobs to the market according to the panelists. Latest data published by the Concentration of Tech ranked Maryland the state with the 4th highest concentration of tech industry workers. The state’s tech industry currently employs 8.6% percent of workforce, losing 400 net jobs, in 2010 during the first year of recession. Regional economist Bauer said that the impacts of state spending cuts are still working their way through the labor market, but trends remain positive. “I see the unemployment rate going down again…” said Bauer. In 2010, Gov. Martin O’Malley approached the Board of Public Works three times for a total of $614 million in cuts from the general fund. In 2009, the governor also asked for a total of $429 million in spending cuts over three requests. And in 2008, he requested a single $213 million cut. Governor O’Malley recently received approval from the board to cut $84 million this year. The $84 million dollar budget slash will include 61 vacant job cuts from the state’s workforce and no layoffs for state workers. Maryland’s current general fund budget stands at $16.1 billion. The total budget is about $39 billion.